Description: 150mm Rosewood Finish 9mm cover 5m fascia board. To be fitted on top of timber fascias. Dimensions: 9mm x 150mm x 5m .. Description: 175mm Rosewood Finish 9mm cover 5m fascias board. 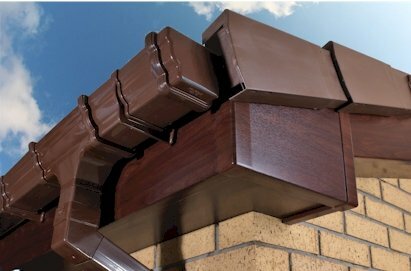 To be fitted on top of timber fascias Dimensions: 9mm x 175mm x 5m .. Description: 200mm Rosewood Finish 9mm cover 5m fascias board. To be fitted on top of timber fascias. Dimensions: 9mm x 200mm x 5m .. Description: 225mm Rosewood Finish 9mm thick cover 5m long fascias boards. To be fitted on top of timber fascias. Dimensions: 9mm x 225mm x 5m .. Description: 250mm Rosewood finish 9mm Upvc 5m cover fascia board - To be fitted on top of timber fascias. Rose Wood Finish. Dimensions: 9mm x 250mm x 5m .. Description: 300mm Rose Wood Finish 9mm cover 5m long fascias board. To be fitted on top of timber fascias. Dimensions: 9mm x 300mm x 5m .. Description: 400mm Rose Wood Finish 9mm cover 5m long fascias board. To be fitted on top of timber fascias. Dimensions: 9mm x 400mm x 5m ..